The State of Kerala did not provide BJP with a single MP.So the state do not deserve a minister during the whole tenure whenever NDA is ruling. But still Modi and Amith Shah has decided to make a malayali as Union Minister. 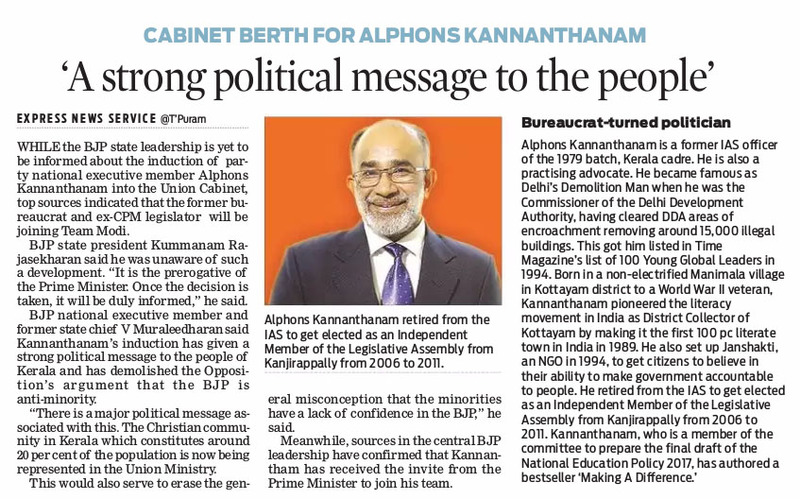 Sri Alphons Kannanthanam deserves the position because his track record is awesome and the perception of him among the public is of a strict administrator and honest man.The secret behind the success of Modi is that he picks the best men and give them free hand to perform.Kerala BJP sympathisers who suspect the Church behind the plum posting should understand that this choice was for national interest whether Church played any role in it or not.If Kerala chooses to give more MPs and ready to shed the BJP hatred , they will get more representation in ruling the country.Merit alone should be the only criteria in important positions.Tags like chrisitan,muslim,NSS, SNDP, Dalith, Women should not be used to fool people. Should one glorify as well as pray to God? എന്താണ് ആസാദ് മൈദാൻ കലാപം ?